Classically comminution is associated with crushing and grinding to a fine size, something like the well established norm of 75 microns. But especially where the purpose is either flotation or even more so gravity concentration then the coarser the mineral can be liberated the better, within the upper limits of the process of course. Even where the purpose is cyanidation, finer grinding is dictated by the dissolution curve, and going beyond the optimum just entails extra grind energy. In a nutshell, it is definitely a case of horses for courses and one size definitely does not fit all. Then there is the effect of mineral hardness and brittleness. Some minerals, for example scheelite or cerussite grind far faster than the host rock and if the only consideration in the P80 of the total then certainly the target would have been preferentially ground well beyond that, rendering recovery difficult to impossible. So the methodology is to first remove any naturally occurring fine target before gently crushing the remainder in closed circuit with a screen to take off successive amounts as they are generated. Rolls crushers are particularly useful for this gentle crushing role. Impact crushing has proven to me metallurgically advantageous because the energy goes into splitting the rock upon fracture planes or zones of weakness, like grain boundaries. The result is mineral liberation at a disproportionately large particle size and APT has termed the phrase ‘early liberation to describe this. APT uses its own design RD impactors for this duty, which utilize very high impact energy for breakage. In cases where minerals are hosted in an oxidized matrix it is useful to use an efficient scrubbing device like the APT RG scrubber, where the retained rock load in the scrubber acts like an autogenous mill to break up the friable lumps without pulverizing the mineral itself. A typical APT approach is to first target the scrubber amenable fines and then impact the oversize after a jaw crush to reduce oversize lumps. The resulting product is recycled to the scrubber to remove the generated fines and the surviving oversize either goes around again, or progresses to a rod mill for a further nip. The RD impactor may be replaced by a rolls crusher in certain cases. A typical flowsheet is depicted below, in this case for ultra soft target mineral. APT’s associate laboratory Peacocke & Simpson is equipped with all of the comminution devices to test which is best suited to your ore’s mineralogy. The lab then applies gravity or flotation and/or cyanidation to verify the choices and estimate the potential recovery. Usually a 100kg sample is required. Once the groundwork has been established, APT’s engineers can progress to a process design and plant costing with confidence, and then install the correct plant for the job. For further information, please contact us here, we are always happy to help. Mining in Zimbabwe has been an adventure for us here at APT over the years, and with the recent attention in the country, we think it fitting to place some focus on the huge potential it has. APT has installed and commissioned several processing plants in the country, from gold recovery through to chrome recovery, tantalite recovery, tailings re-treatment and more. We have assisted a variety of miners, from those just starting out through to those well advanced in their mining journey, in both knowledge and experience. We don’t anticipate the Zimbabwean mining sector slowing down anytime soon, so if you’re looking into getting started there, you’ve come to the right place! We invite you to browse the APT website, see our videos and scroll through the various plant options available. For detailed information on mining in Zimbabwe and APT's experience, please contact us. We look forward to assisting you in starting your Zimbabwean mining venture! Having recently celebrated Women's Day here in South Africa, it comes at a fitting time that we congratulate the Environmental Women in Action on the acquisition of an APT GoldKacha concentrator. We are proud to work alongside such people and look forward to seeing their journey unfold. This also inspired us to look back on our own mining journey, one which continues to bring us much pride and joy. We have worked with men and women across the globe; some looking for large projects, some smaller projects, some just starting out and others far advanced. All with the common goal to mine. Doing so in an environmentally conscious way is something we strive for, without compromising on recoveries. We also have the men and women who make APT what it is today and if you have stepped into our offices, you would see the work and time each person contributes. For further videos of the GoldKacha and GoldMasta, as well as various other mineral processing plants, please visit our website here. For further information on our mining equipment, please contact us and we will be happy to help! The APT installation and commissioning team just returned from a successful mine site trip in Southern Africa to install and commission yet another one of our modular TriTank cyanidation plants, the TT20. We have a whole article dedicated to the TriTank where we explain it all more in depth, so if you have not yet heard about the TriTank we recommend giving it a read. This plant is a step away from conventional CIP/CIL cyanidation plants and is not only more efficient, but is also more environmentally conscious. Being triangular in shape, our six sectors fit into one circular tank, creating a range of benefits from on site cleanliness, efficiency, smaller land footprint, less material usage and more. Recoveries are high and we are so proud to have designed this plant and made it a part of our mining equipment range. The TriTank is not limited to this size, we also offer a much larger modular version which you can see operating on site here. Congratulations to the team and thank you to our valued clients. We hope you enjoy these clips from site! 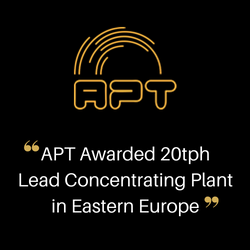 APT has received the order for a 20tph lead concentrating plant destined for Eastern Europe. This major milestone demonstrates the client's faith in APT's ability to deliver this important facility on time and within budget. It also underlines APT's growing diversity into the wider spectrum of mineral recovery, which to date includes gold, platinum, copper, tantalite, tin bauxite, wolframite, chromite and gemstones. Congratulations to our APT team and we look forward to making this project a success. APT wishes their client Comprecraft a successful future for their many local and regional projects. Comprecraft plant: Feeder, classifier, two APT TT20 CIL units. The past few weeks have been nothing short of a whirlwind at our offices and we have loved every minute! The buzz of the welding coupled with the hum of the forklift and chatter of the workers just added to the excitement in the air, it is the middle of the year and 2018 is in full swing. Shown above is a picture from our Instagram live platform (be sure to give us a follow on @aptprocessing for up-to-the-minute updates), of one of our most recent plants, and favourites to build, the APT TriTank TT20 CIL circuit. We manufactured two TT20's for this particular project, along with a feeder, conveyor and milling module. The plant was built and pre-assembled in our offices in Johannesburg, then freighted to its final destination in Southern Africa. From this point on, most of us do not see the plants until they are fully installed on site, so we look forward to the installation and commissioning updates as much as you. As soon as the plants arrive on site, our on-site team gets to work efficiently. This is what they did after a day or two, and we look forward to seeing the end result! 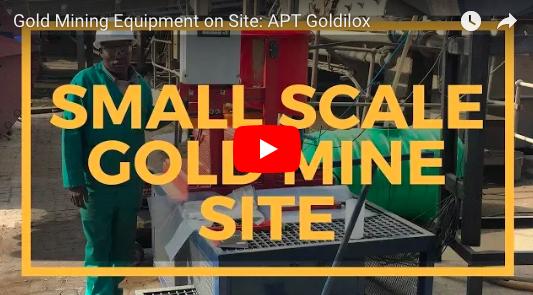 Here is a raw snippet from our time on a small scale gold mine site with APT's Golidlox safe concentrates storage system operating in conjunction with the RG30 Scrubber for optimal mineral recoveries. The RG30 is a 3tph alluvial gold processing plant, available as either a standalone set-up or in trailer version. Our mining equipment has been designed in such a way that various components can be seamlessly coupled together as per your requirements; visually and operationally pleasing. The Goldilox part of this alluvial processing plant facilitates an automated flush of the GoldKacha concentrator, and stores the gold bearing concentrates in a secured lock box for collection at the end of the shift. Now you can have peace of mind that your gold is right where you left it. Secure, safe and efficient. We have a series of videos here on our website showing you exactly what it is like on a mining site and mining with APT equipment. For more on the GoldKacha, Goldilox or our range of RG scrubber plants, visit our website or contact us on info@aptprocessing.com and we will be there to help. APT have always taken the approach of providing solutions to problems faced in the industry, rather than simply providing equipment, and we apply this ideology throughout our range from the ground up. A large part of this is taking on client feedback, listening to what you need and want and being able to produce that. We wanted to feature that feedback in this article, as a testament to our valued clients, the mining equipment and the hard work and dedication that comes from within the APT team. These testimonials are for the RG scrubber and over time we will be covering the entire APT mining equipment range. "The combination of the RG100 with the Knelson MD12 concentrator is an excellent match. Even the most stubborn clays are disintegrated by the autogenous scrubbing action in the drum section (assuming correct feed rate), and this plant combo is excellent for processing of eluvial and alluvial ores, especially smaller high value deposits." - J. Duguid (Managing Director, Stillram Mining Co.p/l). Below is an RG100 scrubber coupled with the FLSmidth Knelson concentrator for optimal gold recovery. Above is an RG100 scrubber, and below is an RG200 scrubber. The above pictures show 2 APT RG combo plants on differing mine sites. The set up is neat and allows for seamless installation, commissioning and operating. Thank you to our clients for your support and to the APT team who make it all possible! For more information please contact us here or email us on info@aptprocessing.com and we will respond shortly. The APT TriTank was designed several years ago and adopted an unconventional approach starting with its triangular design. This results in more ideal mixing leading to superior solid suspension and gold dissolution and higher dissolved oxygen levels. The well-sealed motor design ensures oil spillages into slurry are minimized and thus metallurgical performance is enhanced. The design also uses a smaller land footprint and less construction materials. The Tritank can be relocated to multiple sites, reducing "mine-to-process" transport costs. These tanks have a wide range of applications and can be setup for Carbon-In-Pulp (CIP), Carbon-In-Leach (CIL), or Carousel operation. The mixing profile is so much better in tests and in practice, that the design has completely eliminated the need for baffles which present a large amount of hassles in circular tank operation. Indeed, there is nowhere to put them. The mixing mechanism results in more rapid leach kinetics for a smaller plant or a higher throughput. This allows pulp flow to be directed from any sector to any sector, even from stage 1 to 6, without long launders. This allows any sector to be taken offline for maintenance, or the plant to be operated in carousel mode. What is conventionally achieved through 6 separate, large tanks is now achieved through one tank sectorialized into 6 compartments. The hexagon shape results in 27% less footprint than 6 circular tanks of equivalent volume (1/1 H/D ratio). This impacts ground space but also on foundations, bunds, decking, cable runs & pipe runs, & more. To find out more about the TriTank or APT's range of modular mining equipment, please contact us here or email us on info@aptprocessing.com and we will get back to you shortly. To see more pictures and videos, email us to be added to our newsletter and get the latest news delivered to your inbox. For further information on mining equipment or if you have any mining related questions, email us on info@aptprocessing.com or contact us here. As mining equipment engineers and suppliers, we often get asked various questions relating to our mining equipment as well as common themes or misconceptions within the mining industry as a whole. We often answer these questions on our social media pages, namely Instagram and Facebook, but incase you missed it here is the past mining week in review! A: How well a particular ore responds to gravity recovery is entirely dependent on it’s metallurgical properties. We recommend carrying out prior mineral testwork through our associated laboratory, Peacocke and Simpson, before deciding on a plant process design as recoveries can vary greatly. The ore dictates the terms, and will determine the exact flow of equipment required to obtain the best possible recovery. Visit the Mineral Testwork page on our website here to find out more. Q: We’re often asked to send a full catalogue and price-list for all our gravity recovery plants. Why is this not possible? ⠀⠀⠀⠀⠀⠀⠀⠀⠀ A: APT currently offers over 100 different combinations of machines/plants to suit your particular ore and testwork parameters. Hence we prefer you give us detailed information at the time of enquiry. We will then be able to select the most relevant solution for your needs and quote accordingly. We are continuously looking to update our website with information that is helpful and relevant to the mining industry today. Should you have any other questions, we are happy to help- simply fill in our contact form here or email us on info@aptprocessing.com and we'll get back to you shortly. In a nutshell, the RDGK is a complete hard rock gravity recovery solution, combining the APT impact crusher and GoldKacha concentrator in one neat, modular package. In keeping with APT's philosophy, the RDGK has been designed in such a way that you can add onto the individual components as you grow or as your resource requires. As such, there are several variations available depending on your requirements and affordability. Below are some of those versions including the Goldilox, incorporating the gold storage box, and the RDGK trailer plant for optimal mobility. If you have any questions, comments or concerns, we are always here to hear them so feel free to email us on info@aptprocessing.com or contact us here. Below is the diesel powered RD15 Impact Crusher, with a capacity of 1.5 tonnes per hour. Completed and ready for shipment. As you will see, it has been designed such that the GoldKacha can be fitted beneath the crusher should the need arise. The GoldKacha has a capacity of up to 3 tonnes per hour. Below is an RDGK with automated and secure Goldilox™ system. A dry run is always completed before any plant heads out to site, with this one in particular heading off to it's new home in Southern Africa. The Goldilox™ system ensures there is no access to the concentrates generated during the run cycle. All concentrates are automatically discharged at pre-set intervals into a locked concentrate box sitting beneath the GoldKacha. The security cage and concentrates box are unlocked at end of day and the concentrate box is taken to a secure area for upgrading and smelting of the cons. The run time interval is pre-set by the mine operator and password protected. Goldilox™ also logs run time to allow owners and operators to see a record of daily use and total use. Combined with APT’s alluvial and hard rock plants, small scale miners are now able to run a secure operation on a start-up budget with the peace of mind, knowing gold recovered remains yours. Below, manufacture and pre-assembly is complete on APT's 1.5tph hard rock and spirals processing plant, built in a record time of just 6 weeks. Here is a video of our trailer version of the RDGK, showing exactly how it operates. Last but certainly not least is some outstanding gold product processed using the APT RDGK15 plant, with the GoldKonka for upgrade. The RDGK15 is one of our smallest hard rock processing plants, and boasts the perfect balance between simplicity and efficiency. An APT TriTank TT500 has taken shape! This is one of our latest TriTank operations, nearing completion. The GroundBreaker Range is one of our most popular, catering to both the artisinal and small scale mining markets. The equipment can process sand, clay or hard rock, and is able to recover a variety of different minerals. The modular design allows for the implementation of a small startup operation, onto which different units can be added as the need arises for you to process more, or different, material. The result is a small capital investment, the ability to grow your project through internal funding, and the opportunity to optimize and streamline as you go. 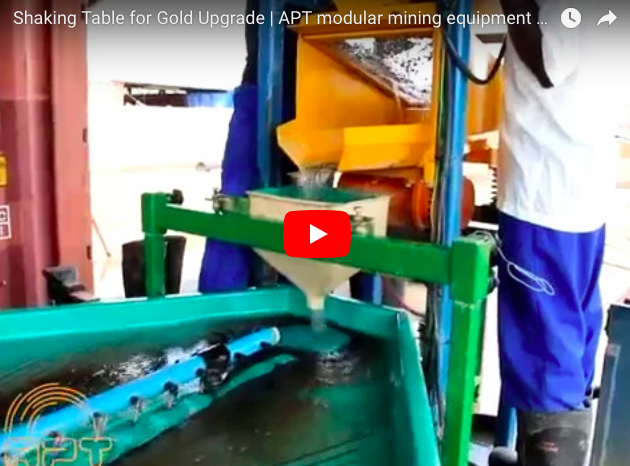 The GoldKacha concentrator and Gold Masta sluice at a training facility in Tanzania, where groups of artisinal miners are empowered to operate efficiently and responsibly. Just a water and power source is required, and you're ready to go. For more information on APT's range of mining equipment, please contact us or email us on info@aptprocessing.com. We look forward to hearing from you! Artisanals have a nose for gold, and tantalite, and tin, etc. They somehow find small rich veins and outcrops, mainly in the oxide horizon, and target these with great energy. The result is not often pretty and, more often than not, wastefully inefficient. Far more than just efficiency, where gold is the target it is also hazardous due to widespread use of mercury. There will always be this activity and more often than not, whether it be in Africa, South America or the Far East the result is invariably conflict. We at APT are not into the politics of the situation, nor are we an environmental action group, but we care. We care enough to have developed a range of efficient, clean and viable options to give this group of miners a chance to operate and produce responsibly. Viability is the key word here, you cannot legislate for people to choose an alternative Building upon our experience over many years of dealing with artisanals, it would seem that about 1tph is the necessary and sufficient tonnage to support the group that must feed off the system, about five people. This will simply never provide enough income for growth. APT’s range is built around the well renowned famous GoldKacha concentrator. This unit has been developed to be a stand-alone mini processing plant that accepts 1tph through its integral pre-screen and then feeds the broken down material uniformly into the concentrating bowl below. The unit comes with a scavenger sluice (GoldMasta) and a small upgrading bowl (GoldFountain) that can be coupled with the very same GoldKacha, bringing the concentrates to a panable product. 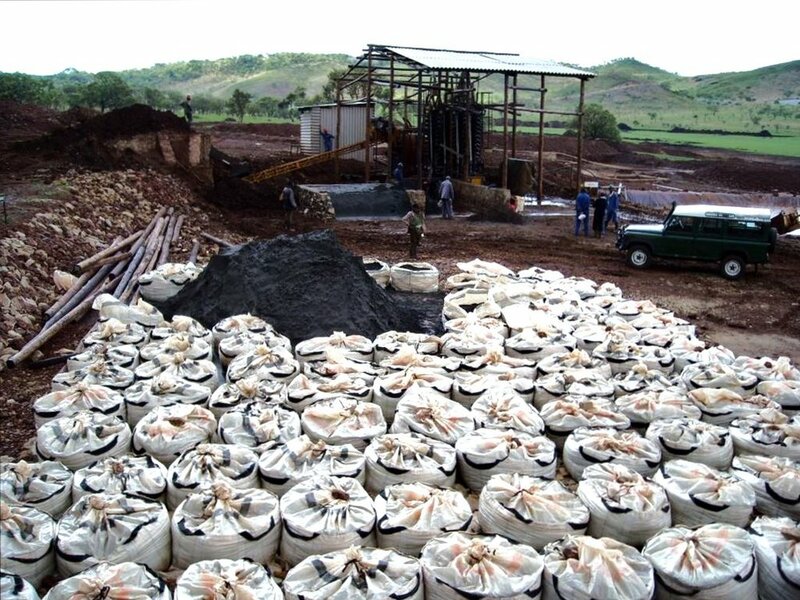 All of the above equipment is also suitable for tin, tantalite and any similar heavy minerals that are the Artisanal’s target. Specifically for gold applications APT has taken the bar even higher and has produced an entirely mercury free solution that really is simple and easy to use. The gold is first concentrated via the GoldKacha, GoldFountain and pan and then the gold is ‘picked’ with APT’s revolutionary GoldFix compound. The final stage to pure gold involves nothing more than the dipping of the gold laden GoldFix into hot water and there it is! These solutions have been provided to countries Africa and South America, as well as Indonesia and the Philippines – a proven track record. APT is well placed to supply large Corporate Responsibility Programmes with everything needed to create a sustainable, viable, clean outcome. In this article we're showing you our alluvial and hard rock RG Combo plants, ranging in size from 10tph through to 80tph. These plants can process both alluvial and hard rock material, efficiently washing, crushing and processing gold and bulk minerals, depending on your requirements. Below is a model of the plant, followed by the plant on site. This gives you an idea of the scale and streamline design of the alluvial and hard rock processing plant. Often you- the client- want to see a mine site operating with your potential plant. This makes your vision more of a reality and gives a sense of confidence and security going into the project. It takes away more of the unknown; this is what it is like on a mine site that could be yours. We cannot physically take you to mine sites, but we can take you on a virtual tour through our mining equipment videos. We have compiled a series of videos not only of our equipment in-house, but also on site. These videos cover the entire mine equipment manufacturing phase through to on-site mine installation and commissioning. To view these, visit our videos page here. Below we have included the video of an alluvial and hard rock mine site, as pictured above. Let us know if you would like to see any other videos from various mine sites or have any other mining related questions. We look forward to hearing from you! Since APT launched our small scale piloting/concentrate treatment 20m^3 TriTank, the TT20, several have been manufactured, installed and commissioned on various mine sites. The results have been impressive and we are very proud of this cyanidation plant! Here is more on this piloting/concentrate treatment plant. Ores do not respect scale, the metallurgical requirements for a small project are the same as for a large one. If anything the demands upon a small project are higher because economy of scale is not with them, so efficiencies have to be even higher. Following on the back of the huge success of the larger Tritanks, APT once again has designed a product to address the small-scale start-up market. The TT20 is a 20m^3 CIP/CIL tankage system and with advanced mixing design and higher oxygen ingestion leach kinetics are improved significantly. By analysing the leach curve of the materials, the operator can make an informed economic decision as to the required residence times of the ore. In some cases this may be as low as 8 hours resulting in a 1.5tph throughput. The entire plant is modular and can be moved to a new site within 2 days. With inherent benefits like smaller footprint, less materials, and built in carbon transfer the baby TriTank is the obvious choice for projects on a budget, but nevertheless wanting advanced technology. This unit is not only perfect for fresh ore and tailings retreatment at small scale, but also for cyanidation of bulk concentrates, for example sulphide concentrates from flotation. The TT20 can be supplied as an addition to an existing system, or it can be supplied with the relevant up-front APT crushing and grinding modules to result in a complete processing solution.